Walmart announced "Walmart Pay" in December of 2015, bundling its mobile payment solution directly into the Walmart app for iOS and Android devices and entering the market one year after Apple's own Apple Pay launched in 2014. Now available nationwide in 4,774 Walmart stores, Walmart Pay is "close to surpassing" Apple Pay in terms of mobile payments usage in the United States (via Bloomberg). Wal-Mart Stores Inc.’s app is close to surpassing Apple Pay in usage for mobile payments in the U.S., giving the world’s largest retailer even more clout as a growing number of people shop with their smartphones. 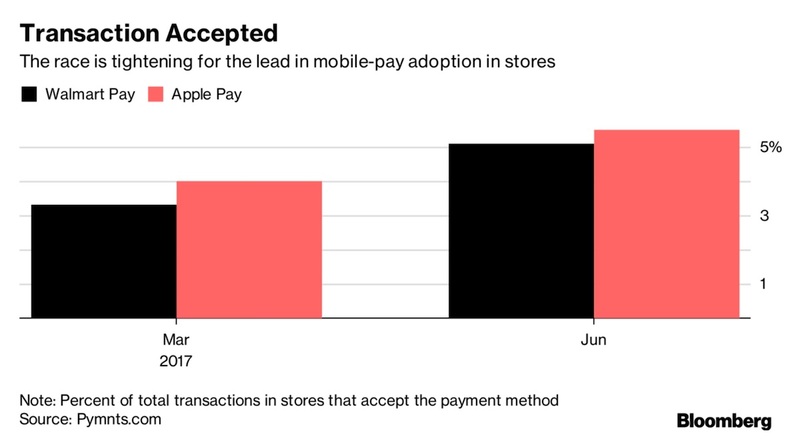 Market researcher Richard Crone predicted that Walmart Pay will grow bigger than Apple Pay in active U.S. users (who use the mobile wallets for at least two transactions per month) by the end of 2018. Walmart and Apple reportedly held discussions in early 2016 that centered upon incorporating Apple Pay into the Walmart iOS app, but fell through because of the "difficulty of blending the technology underpinning each company's approach." Walmart is said to have begun gaining ground on Apple earlier in 2017, when 5.1 percent of Walmart shoppers said they used Walmart Pay this past June, just below the 5.5 percent of iPhone users who said the same at locations that accept Apple Pay. In terms of other competitors, Walmart Pay's adoption rate is "higher than Samsung Pay and Android Pay combined." One analyst pointed out this is likely because Walmart owns and controls the mobile wallet software and "can make quick changes." “Apple Pay’s road is much more difficult than Wal-Mart’s is,” Brendan Miller, an analyst at Forrester Research, said in a phone interview. “It means that Wal-Mart can make quicker changes, they can move faster in many respects than Apple Pay.” Forrester’s survey of 58,000 online consumers in the first half of 2017 found that 7 percent of them used Apple Pay in the past three months, while 6 percent used Walmart Pay. Although the services are similar in their payment goals, there are a few differences between Walmart Pay and Apple Pay. Walmart's mobile wallet presents users with a barcode that has to be scanned to complete a transaction, unlike Apple Pay's NFC tap-based system. Walmart Pay also incorporates all of a user's in-store offers, promotions, rewards, and gift card balances in one place, which Apple Pay is still inconsistent in supporting for many stores. Despite their close rivalry in the mobile wallet space, Walmart is reportedly "more interested" in directly competing with Amazon than Apple. Over the past year, Amazon has been expanding quickly in the grocery space with its various test projects like Amazon Go and its acquisition of Whole Foods. Walmart said it will continue focusing on expanding the features of Walmart Pay as more competition emerges, and according to Crone the debut of the software has provided a solid launchpad for the company's future: "They flawlessly deployed the system, and it works." Well we know this "study" wasn't peer reviewed. Walmart Pay is accepted in Walmart and Walmart and Walmart... Apple Pay is accepted in many stores. This is a comparison of two very different things. If Walmart Pay branches out and is accepted at other stores then we can start to make the comparison. I avoid Walmart at all costs. Meh, Walmart pay is not a payment in other stores. That is like comparing Apple Pay to Target gift cards. I am glad they see value in Mobile payments, however misguided. You day will come, Walmart. No one will stop the Amazon steamroller. If only Apple would incentivize companies to switch to NFC faster. They're just hoping that companies adopt NFC because users want it, but clearly this isn't happening fast enough. It would also be great if Apple used just a small portion of their profits to create an incentive for consumers, like getting iTunes credit for ever X amount of money spent or transactions made. Samsung Pay and Android Pay both have similar promotions. The problem is corporations aren't willingly switching to NFC just because a very small user base want it. Unsurprising. Apple pay is basically Walgreens pay. Most merchants aren't even sure if and what NFC they support and it seems to rarely be Apple based on waving my phone around. And small businesses are almost exclusively square these days. That's the key, isn't it? In other words, Walmart. When I woke up today, I felt like I woke up in a new dimension and then I read this story. Is Walmart pay directly comparable to Apple Pay though? I mean, yes, both are mobile payment systems, but is Walmart Pay accepted anywhere other than WM? It seems like it's a one-store system whereas Apple Pay is more "universal." I'm not a regular WM shopper but they are the only place in town that sells Chili Chocolate Granola bars and they are my "crack." So I have to venture in a couple times a year to buy my horde. One thing I noticed that is different than Apple Pay (because it saves WM $ no doubt) is that when you self check out the WM Pay option is the biggest icon. (I don't use it myself -- no reason to). OTOH when I'm shopping at other stores I almost have to know ahead of time if they accept it. There is typically zero promotion of its availability. And that is a problem because no one wants to look like a dolt trying to tap a console that isn't NFC capable (I've seen a lot of consoles that have the NFC logo but the NFC is actually turned off). So I think Apple could do a lot better promotion here -- either lowering the rate it gets per charge or offering merchants promotional $. But in exchange require merchants to display an Apple Pay logo on the console or nearby.